Patent points to novel way to get everyone on board the VR bandwagon. Though the library of available virtual reality content is increasing daily, user uptake of that content is still slower than many companies invested in the tech would like. 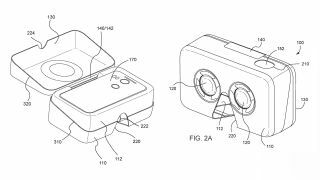 One such company is Google, which has recently published a patent for its idea to turn Android phone packaging into a VR wearable. It is, essentially, a Google Cardboard VR viewer, but one that your phone actually ships in. Rather than an advanced headset construction, the patent specifically points to the use of cardboard and thick paper stock, as well as "adhesives" and "fabric" components. That's fine – an expensive smartphone need not have extra zeroes added to its price tag for an optional function, while it'd be a pleasant additional feature to have a "lite" VR option straight out of the box. It's the ultimate conclusion for Google's Cardboard tech, which looked to bring VR affordable to the masses. For those enamored with what they get from this introductory experience, there's always the Google Daydream View to upgrade to. Google is hardly the first company to explore this idea, though. McDonald's had Happy Meal "Happy Googles" built into its takeaway meal boxes, while Alcatel's Idol 45 also worked a VR viewer shell into a single smartphone purchase. There's also the green-friendly benefit to consider here too – you've suddenly a reason to hold onto a box you'd otherwise throw away. So thumbs up all round here – hopefully it's a patent Google will put into practice.